While raking leaves this fall, consider all your plantings around the home. Fall is a great time for moving and removing perennials and shrubs as well as planting new! First when it comes to raking: rake leaves off lawn as regularly as possible. Raking is great exercise, makes less noise than blowers and helps aerate the lawn soil. Wet leaves will be harder to clear and if left too long, will start to kill the grass. Leaves can be gathered into piles for composting. Once you have a significant pile of leaves out of the way, run over it a few times with a mulching lawnmower. The chopped tree leaves can be incorporated into flower bed soil or scooped into a compost pile where they will break down into compost quickly. Test soil for acidity. Fall is a good time to incorporate lime into soil. Did your garden suffer from Japanese Beetles this year? While soils are still warm (through mid-October), you can still spread pellets of the Milky Spore bacteria that infect and kill Asian and Japanese beetle grubs. Grubs have hatched and are starting to feed on grass roots. Spreading now and watering into lawn areas will introduce the bacteria to the early stages of beetle development when the larvae are smaller and more vulnerable. Aerate and dethatch lawns if needed, then apply fertilizer. 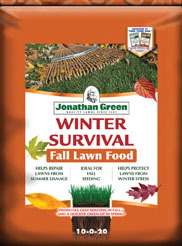 In the absence of a soil test, now is the time to use Jonathan Green's Winter Survival fertilizer. Winter Survival, with an N-P-K ratio 10-0-20, is a high potash formula to help encourage fall rooting and prevent winter disease with just a the right amount of nitrogen. Forecasts look like our first frost could be around October 15. Mow lawns until hard frost stops growth, usually into November. With each mowing, gradually lower the mower blade so that grass height is 2 inches for winter dormancy. remove yellowing and diseased foliage. Spent annuals should be removed completely. Foliage covered in fungus rusts or powdery mildew (that white, dusty-looking coating) should be disposed of with trash. Other material can be composted. Now you can plant mums, ornamental cabbage and kale to fill in the empty spaces in flower beds. Native perennials are still available. Adding these to your gardens will help our pollinators by providing late-season food. For annual plants like cleome (spider plant), cosmos, dill and others where seed-heads have formed, let them self-sow by spreading the seeds as you pull the plants. Also collect ripened seed heads of coriander (cilantro), dill, arugula, nasturtium, and sunflower seeds for spring plantings. Perennials with hard seed-heads like coneflower or black-eyed susan will attract birds. Leave a few standing. To PREVENT annual and perennial weed seeds from germinating, spread Organic Weed Preventer with corn gluten. It suppresses seed germination and adds Nitrogen around your plants for a little end of season boost. Some annual flowers and sensitive vegetables or herbs can be protected from early frosts. You can lay light sheets, reemay or blankets directly on plants--not plastic. Use frames or supports for plastic covers. Research has shown yarrow and comfrey to be very high in overwintering beneficial wasps underneath the plant’s leaves. Leave some of these herbs. Also pull some of your last broccoli or other cole crops and set along compost piles until May for overwintering habitat of beneficial insects. Compost next May. Prepare new flower beds and put vegetable beds to rest. Remove sod or weeds, add organic matter (manure, compost, chopped leaves) and turn over the soil. Bare ground attracts weed seeds so plant a cover crop of winter rye to till in come spring. It will handle temperatures as low as -30 degrees F.
Trees & Shrubs can still be planted as long as the soil can be dug—into November! Before you buy, plan your plantings well considering average moisture, light, wind, and hazards (like driveways, salt trucks, snow piles). Don’t lose young shrubs or trees to rabbits and voles! On a warm fall day, install protective 1/4” mesh cylinders around trunks of young woody shrubs and trees so the mesh is at least 3 inches away from the trunk, about 1 inch into the mulch/soil, and 2 to 3 feet high. These small fences will prevent rabbits and voles from chewing the tender bark under the cover of snow. A simple trick is to measure out the mesh, cut with wire snips, wrap around the plant and use plastic zip ties to hold cylinders together. Just snip the zip ties off in spring to store and you can re-use the barriers for a few years. Water new plantings thoroughly by placing a hose at the plant base for 20 minutes once a week or (twice a week if dry) through November! Rake up and bury scab-infected apples, crabapples and other fruits to avoid rodent pests and prevent disease from overwintering in the garden. Do NOT prune spring flowering shrubs now or you will cut off the flower buds. These tips expand on ideas offered by the University of Massachusetts Extension Garden Calendar. Visit the UMass Extension website for more information.